This entry was posted in Bolivia, South America, Travel and tagged adventure, Bolivia, bucket list, Bucket List Publications, photo, photography, South America, travel, vacation by lesleycarter. Bookmark the permalink. That photo is absolutely beautiful. Great job. You can see the rest of the photos of you click “continue reading”; they are amazing! I’ll do that Lesley, I didn’t see the button, but appreciate the heads up. That first one is awesome! Thanks. Ohhh, I see what you mean. I especially like the 1st of the group. The colors are amazing! reminds me somewhat of the Bonneville Salt Flats in Western Utah. Wow, those pictures are beautiful. The first one looks almost like an oil painting. The writing is great, too! Thank you so much for sharing! I want to go there but haven’t the stamina. It’s fine with me being with you on your adventures. Zowie pictures. Fantastic picture. Makes me want to drive really fast across the middle of it. Unreal landscapes, You are right. Oh my God! I need to go here! A fabulous mixture of colours. Beautiful! Mother Nature continues to amaze. One of my favorite framed photos of my adult daughter shows her on a horse, standing on one of those Bolivian mountains you see in the background of this photo here! Incredible salt flats, those! The colors–whooeee! Amazing! I can’t wait to go there one day! Wow, fantastic photograph. That is majestically and breathtakingly humbling. Thanks! I’ve been there too. Such an amazing, breathtaking place. One of the most beautiful regions on this planet. Traveled is worth its time in gold! 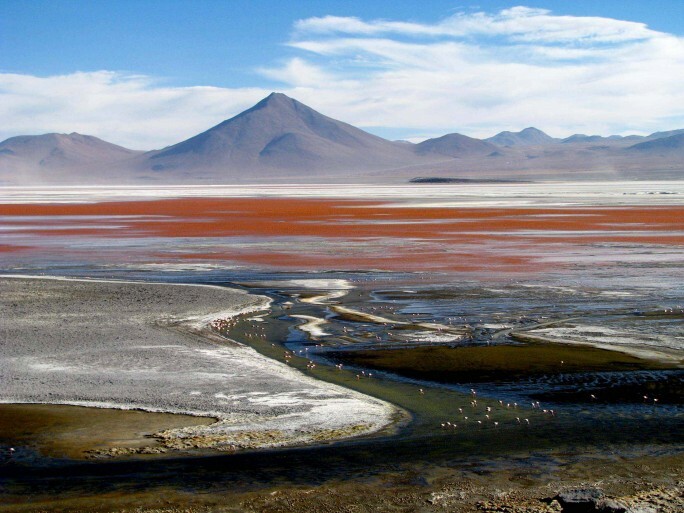 I went to Salar de Uyuni a few years ago. Great job on capturing the natural beauty of such an amazing place!